There are times in our lives where we tend to become complacent. We start to rely more on our own abilities than on God’s ability. It is during these times that we forget that it takes discipline to keep out lamps burning. The Bible cautions us to stay ready, watchful, and ready for service. 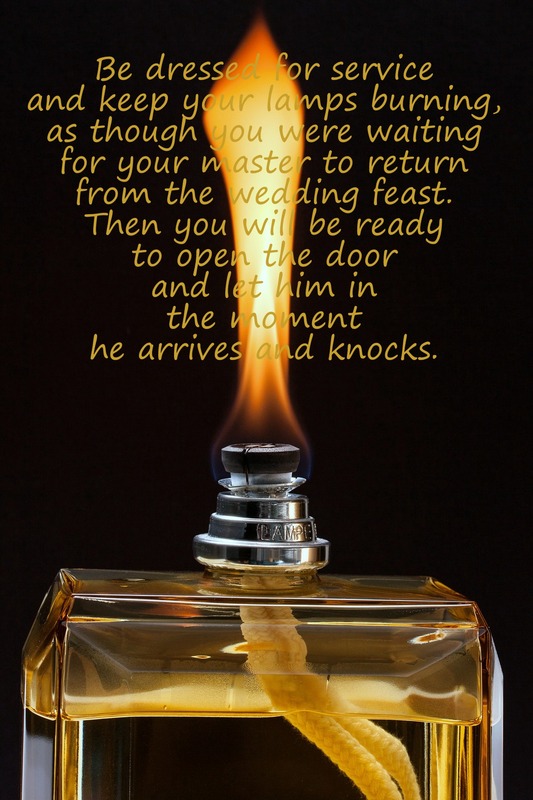 We must be ready the moment that He knocks. God knocks with opportunities for us to share the gospel and bring glory to His name. We are His witnesses to the world around us, both to fellow believers and the lost. We must stay dressed for service. We must realize that even when we thinks others are not watching us, they are. We can not lay aside our Christianity when we feel like it. We must walk it out daily, and confess when we fail. We must keep our lamps burning. We are called to be a light to the world around us. Light is not needed in the day, it is needed in the darkness. Lamps burn because of the oil. We burn because of the Holy Spirit living inside of us. We must stay full. We must be watching. Most hurting people do not verbalize their hurt. Most lost people aren’t looking for a Savior, they are looking for someone who will notice and lead. We have to take notice of the people we come in contact with. Another reason to stay filled with the Spirit, because He can help us to discern what is going on in a person’s life, regardless of the mask the person tries to wear. We must look at the nonverbal communication, the verbal communication, and the spiritual communication that we are sensing to determine what is really happening. Opportunity will be knocking. Will you be ready? This entry was posted in Faith and tagged #FMFPARTY, #OneWord, #Write31Days, Character, discipline, Scripture. Bookmark the permalink. Here I was writing about physical dress you are writing about spiritual dress! Being constantly dressed and ready! Love it! We never know who is watching or when our King will come!